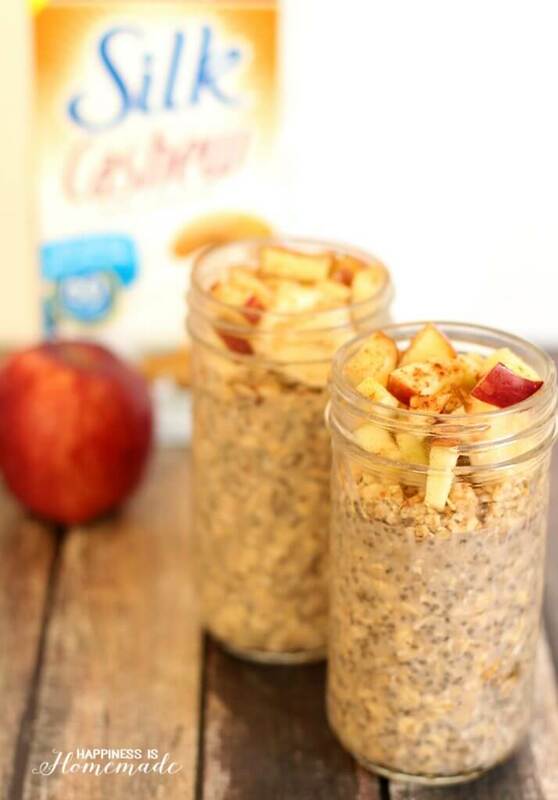 Try these delicious apple cinnamon overnight oats with chia seeds for a quick and easy breakfast on-the-go! 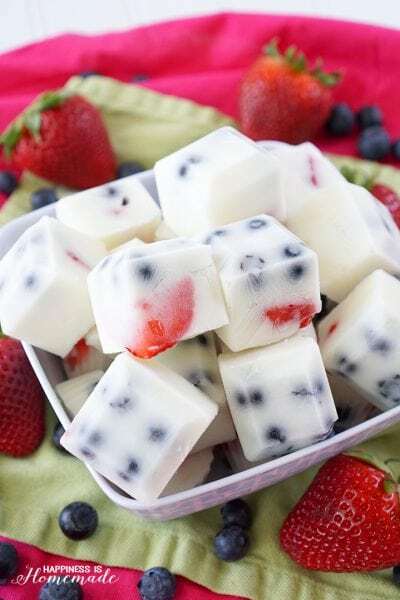 Packed full of protein to keep you feeling full longer! Breakfast is always a chaotic time in our household. 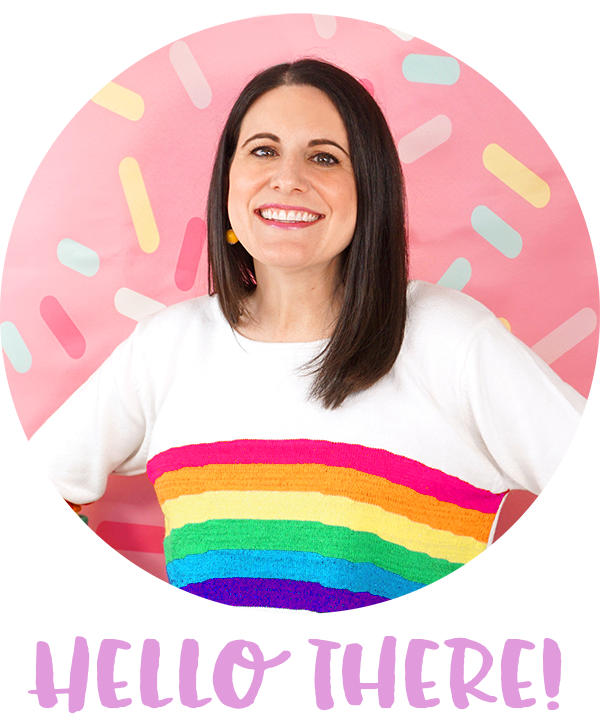 It usually involves rushing around, trying to make sure the kids are awake and dressed, packing my preschooler’s lunchbox, and more often than not, skipping the actual breakfast eating part. Since kicking off our 8-Week Beginner Fitness Jumpstart, I’ve been trying to focus on eating breakfast on a regular basis, and that means that I need meals that are quick to prep and easy to eat on-the-go. 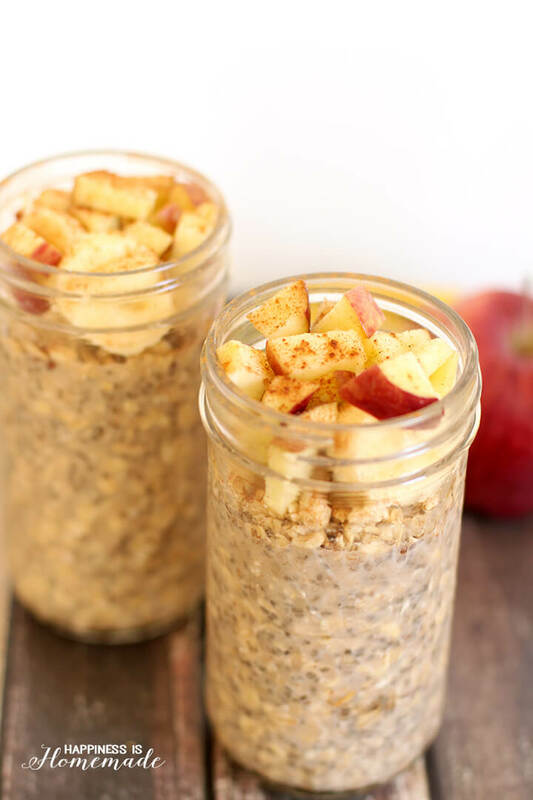 These apple cinnamon overnight chia oats are just the thing I was looking for! Prep time for overnight chia oats is super minimal (about three minutes tops), which sounded really appealing to me as a busy mom-on-the-go. The part that didn’t sound so appealing was the actual “overnight oats” part. I’ve eagerly tried about a half dozen overnight oats recipes, but I was never a big fan of the texture in the morning. The mixture was always too thin and watery, and the oats were tough and kind of bland. I knew that with some tweaking though, I could come up with the perfect recipe! 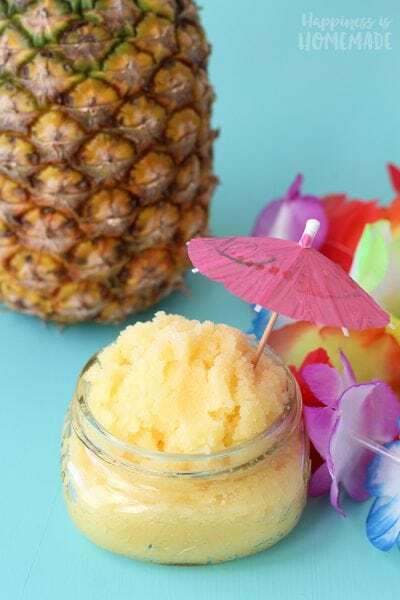 I started by filling a jar with old fashioned rolled oats, applesauce, cinnamon, and a pinch of brown sugar (you can omit the sugar or use honey or stevia to sweeten the mixture as well). I also decided to add some chia seeds since they are known to absorb up to 27 times their weight in liquid to create a creamy pudding. I topped everything off with Vanilla Silk Cashewmilk, gave it a stir, and let it sit in the refrigerator overnight. In the morning, I topped the chia oats with a handful of granola, a few slices of banana and some finely diced apples. 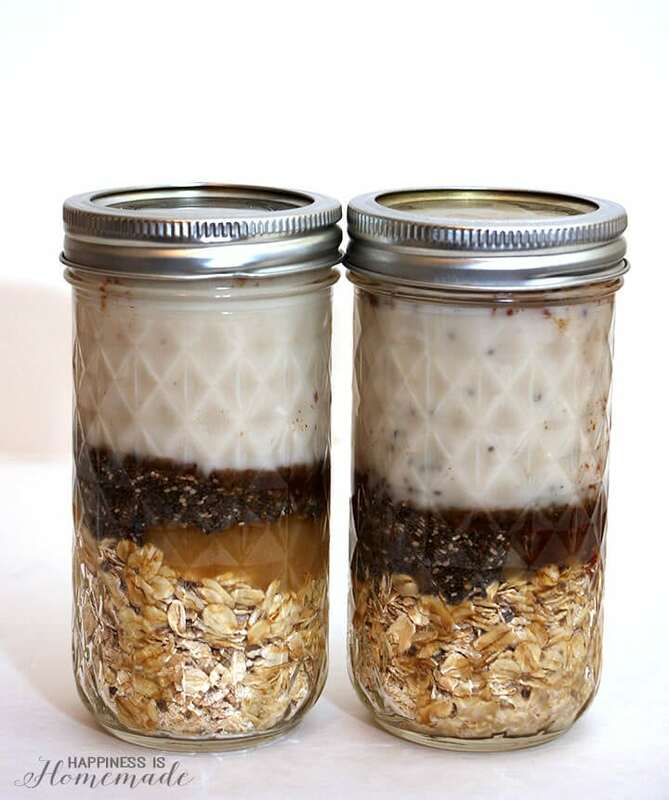 Add all of the ingredients to a pint sized mason jar. Top with a lid and shake well to combine. 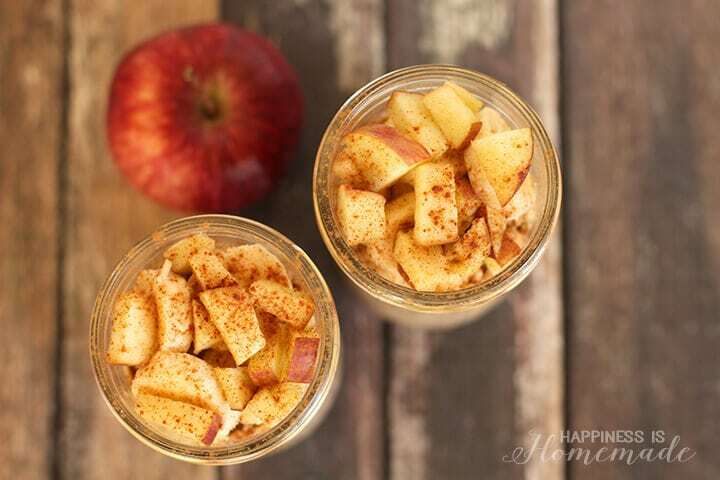 In the morning, top with fresh fruit and a sprinkle of cinnamon. 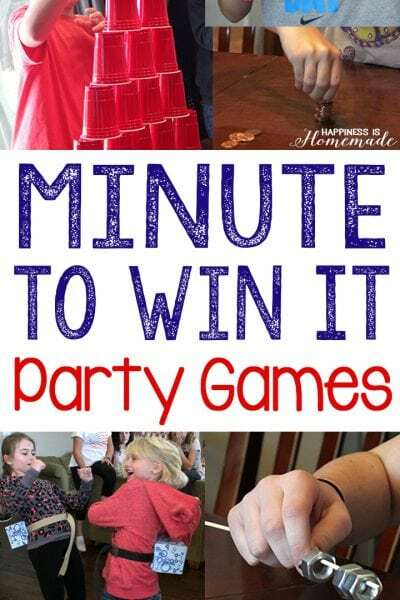 Oats can be eaten cold directly from the refrigerator or heated in the microwave for 30-60 seconds. Overnight oats will keep in the refrigerator for 5 days, so it's easy to prep on Sunday for the entire week! 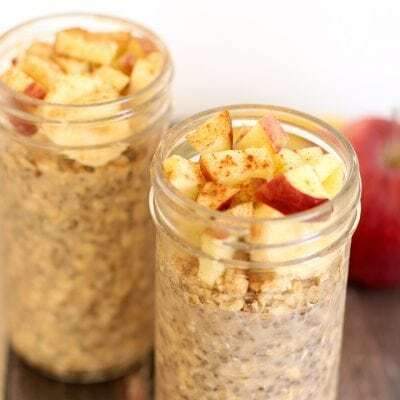 These chia oats are smooth, creamy, and full of rich flavor from the vanilla, cinnamon and apples. 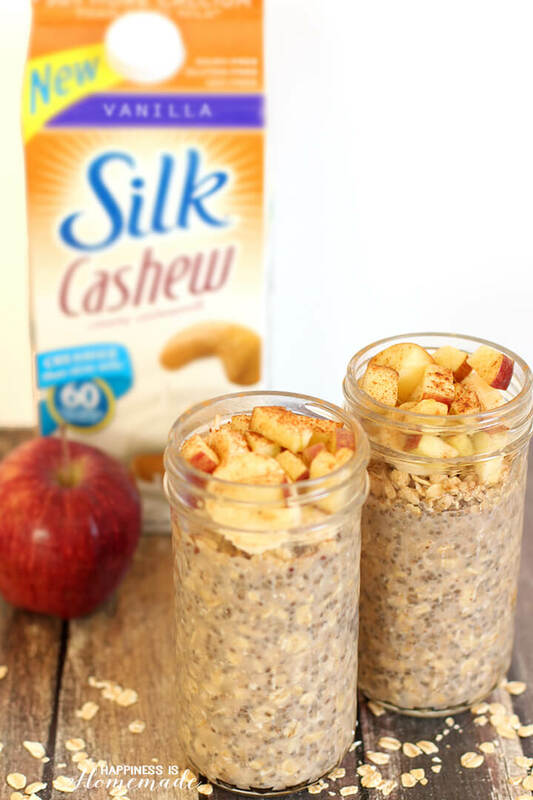 The chia seeds helped the oats reach the perfect texture – soft without being mushy – and the Vanilla Silk Cashewmilk is like the icing on the cake. 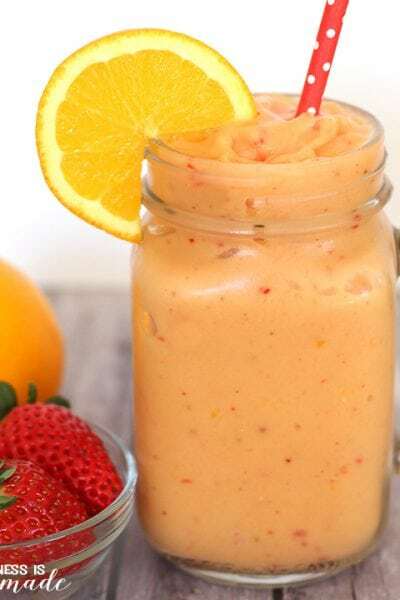 Cashewmilk is much creamier than skim milk, yet they have the same amount of calories (about 53 calories in this recipe), and Cashewmilk has 50% more calcium than dairy milk. I definitely think that’s the key reason why these chia oats turned out so amazing! 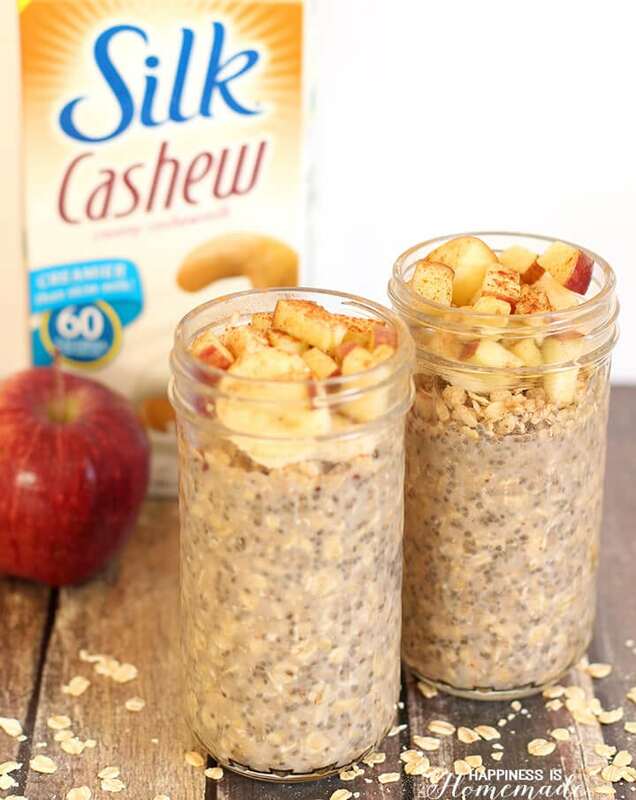 A single serving of these overnight apple cinnamon chia oats packs 10 grams of protein, so they keep me feeling full and satisfied for a long time. 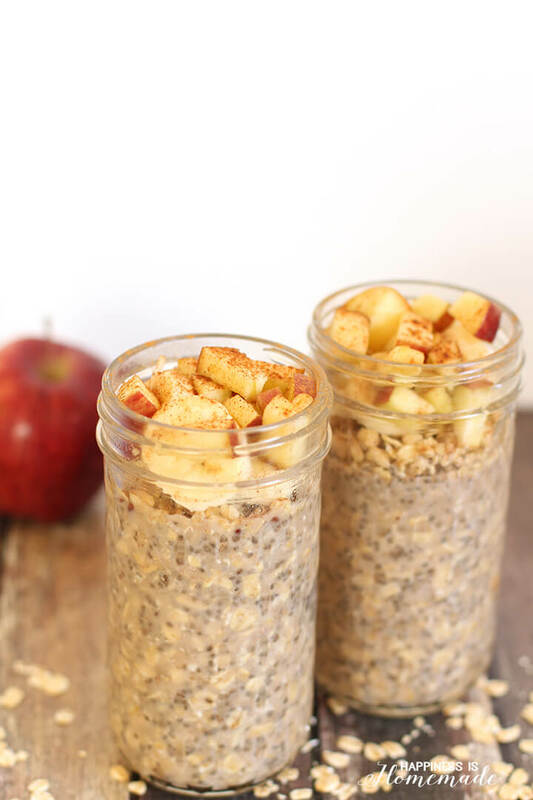 I’m happy to have a delicious new breakfast recipe in my arsenal, and these chia oats are a perfect way for me to snag my breakfast on the run. 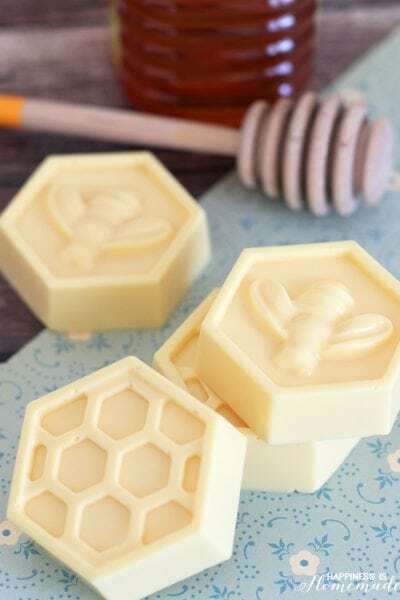 Just grab a spoon, take the jar out of the fridge, and head out the door! Yum!